The Summer bite is in full swing offshore of Fort Lauderdale and Lady Pamela Sportfishing is in the thick of it. We continue to fish at least three trips daily with full boats and crews. Huge smiles are seen all over marina docks as boats tie up with full fish boxes. We’d like to take this opportunity to thank each and every client who fished with us aboard the Lady Pamela II Fleet in July. We greatly appreciate your business and hope that you’ll come back to see us soon, especially our junior anglers who spent part of their summer break offshore with the Lady Pamela II Team. The typical summer weather patterns are holding up as we’ve enjoyed calm seas and balmy Atlantic conditions. Our early morning trips and evening trips have been producing well for anglers who wish to avoid the hottest part of the day. The acres of seaweed that we found earlier in the month has dissipated but there are still patches to be found and they do hold fish. 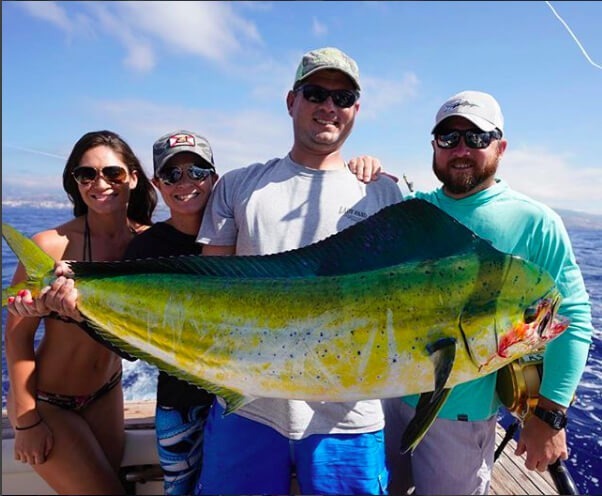 From early to mid-July, the Mahi Mahi fishing exploded as nearly every client was returning to the dock with Mahi Mahi to filet. Most Mahi Mahi were caught between 400 and 1,000 feet of water on rigged ballyhoo, bonito strips and Islanders. Most of the Mahi Mahi weighed 5 to 20 pounds with the occasional 25 -pounder mixed in. The Mahi Mahi bite slowed down as we neared the end of July. If you want to “run and gun” for Mahi Mahi, give us a call to book our 34′ SeaVee, which is optimized to get well offshore quickly and comfortably to chase down the birds and look for structure. For the last few weeks, we’ve been catching tasty Blackfin Tunas in the 10 to 15-pound range inside of 120 feet of water on the troll using Sea Witches and Bonito Strips. We typically troll them at 5 – 6 knots. Blackfin Tunas and Bonitos showed up to take up the slack. Kingfish in the 8 to 20-pound range and Bonitos up to 15 pounds have been mixed in with the Blackfins and have been particularly aggressive on the baits trolled below the surface on planers. Our crews have the training and experience to rig and fish planers just right to get the bite when boats around us miss the shots. Even though the Sailfish season doesn’t begin until the late Fall, we continue to catch Summertime Sailfish trolling the color changes between 100 feet and 300 feet of water. The Sailfish have been responding well to Sea Witches (in blue/white and pink/white color combinations) trolled on the surface between 7 and 9 knots. and rigged Ballyhoo trolled on the here have also been some sailfish around on the edge. We also catch large Barracuda when trolling for Sailfish near the 100-foot depth. The Black Groupers continue to be aggressive in 60 feet of water, as you can see below. These tasty sluggers can’t resist a Ballyhoo or Bonito Strip trolled behind a planer at 5 knots. 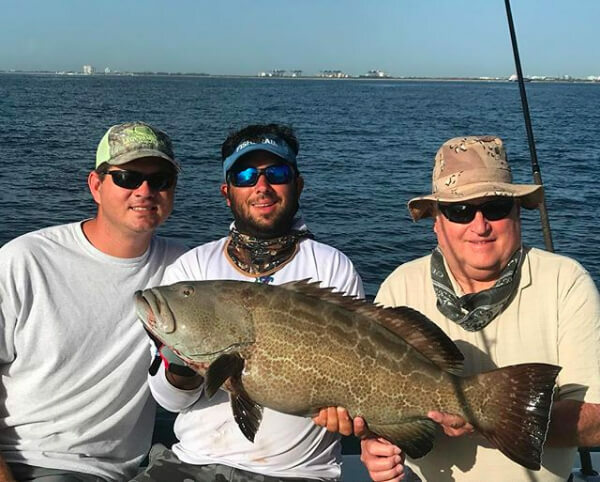 Few fish are as tasty as these Black Grouper and we love to have our clients welcome Black Groupers aboard our Lady Pamela II boats – we have a nice, chilly cooler reserved to transport our special guests back to the dock for dinner. The shark fishing continues to be exceptional! 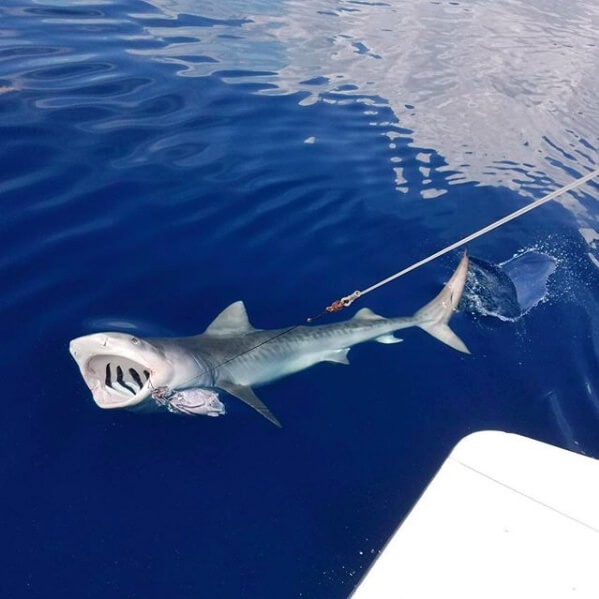 Throughout July, we’ve been fishing for them and each trip has caught at least one shark, with most trips catching several. The highlights of our shark trips in the last few weeks have been the huge Tiger Sharks and Hammerhead Sharks that our clients managed to wrangle to the boat. Let’s start with the Tiger Sharks. Our clients landed a 200-pound and a mammoth 400-pound Tiger Shark last week! Tiger Sharks are some of the fiercest yet beautiful sharks in the ocean, as you can see in the picture above. 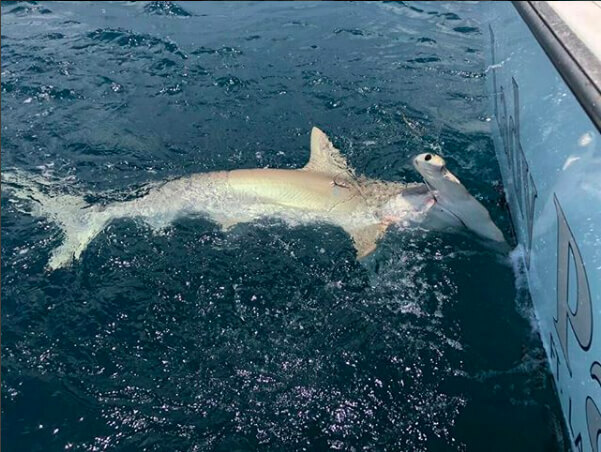 Our anglers also caught a 300-pound Hammerhead Shark, one of the most-prized and unique sharks in the Atlantic Ocean! For good measure, our anglers also caught their share of Caribbean Reef Sharks. All the sharks were caught either on Bonito or Kingfish dropped down in 300 feet of water. There is nothing quite like the slugfest you experience with one of these huge specimens. Both angler and tackle get a workout! The Lois Ann continues her torrid pace of running at least three trips per day. Our day trips have been solid with catches of Kingfish, Bonitos and the occasional Blackfin tuna on butterfly jigs that get deep into the water column. However, our night trips have really hit their stride with a slew of Yellowtail Snappers and Mangrove Snappers being caught on the frontside and backside of the full moon. The Snappers can’t resist the squid and silversides that we send their way, especially when fishing the light leaders that we provide for our clients. We expect the Night Trips to continue to produce for our clients. As we make our way into August, we should start to see more bait show up on the beaches and on the reefs, which should start setting the table for better and better fishing as we the fall months approach. Since kids will be going back to school in a few weeks, now is the perfect time to finish the summer break on a high note – book a trip with the Lady Pamela II Fleet now. Our Team can cater a trip to match any family’s budget and angling appetite.